In December 2012, EPA finalized a little-noticed change in what is “GOOD” air. EPA lowered the upper end of the range for the “GOOD” AQI category by setting it at the level of the revised annual PM 2.5 standard (12.0μg/m3). This revision is final and takes effect nationwide March 18, 2013. The AQI is EPA’s color-coded tool for telling the public how clean or polluted the air is and steps to take to reduce daily exposure to air pollution. The best way to protect yourself and your children: Get out of the smoke. Clean Air Fairbanks is not convinced by EPA’s recommendation to hide out inside. Air exchange ventilation systems, common in Fairbanks homes and office buildings, are designed to replace stale indoor air with clean outdoor air. Often during the winter in Fairbanks and North Pole neighborhoods, clean air is a hazy memory. When air outside is polluted, all ventilators can do is make the inside air just as bad as what’s outside. “Using a variety of statistical methods, the concentration-response curve was found to be indistinguishable from linear, and, therefore, little evidence was observed to suggest that a threshold exists in the association between long-term exposure to PM2.5 and the risk of death.” – Integrated Science Assessment for Particulate Matter 2009, 2-25. No wonder Watershed School parents are growing concerned. An earlier public meeting on Nov 29 in North Pole was attended by 20 residents. At the North Pole presentation, the Borough asked residents to make less smoke: North Pole Air Quality Presentation 11/29/12. The Borough is limited to asking for voluntary compliance because they cannot enforce restrictions on harmful emissions due to voter approval of Proposition 3 on October 2, 2012: Sample Ballot with Prop 3. Will voluntary compliance work? How many open houses will it take? Will more pleas and explanations of the harm make the air fit to breathe? Each of these meetings is being held in a pollution pit. [See the maps in the North Pole Presentation, above.] Many can’t risk exposure by attending. The FDNM editorial board got it right and are finally calling for the state to take “aggressive action” on the “foulest polluters” Bad month: November highlighted need for action on air 12/2/2012. Sources tell us the Governor has taken over DEC’s enforcement authority, so all air pollution concerns need to be directed to him. Then, if the air isn’t too bad, attend an open house to sign up to receive air pollution updates and volunteer not to burn wood or coal on those days. 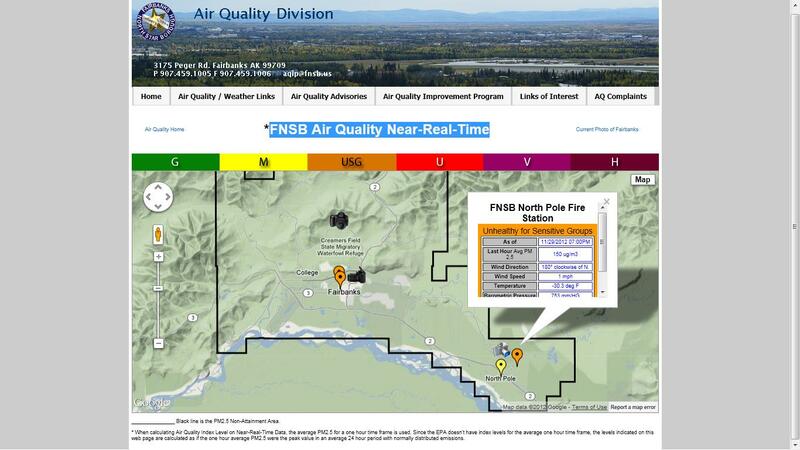 UNHEALTHY and VERY UNHEALTHY air pollution in Fairbanks and North Pole is now in its sixth day. The monitor at the North Pole Fire Station, 3288 Hurst Road at Dawson Road, recorded 150 µg/m3 from 6 to 7 PM today. According to EPA, that’s code purple, VERY UNHEALTHY. The Borough’s Near-Real-Time AQ Map incorrectly showed code orange, UNHEALTHY FOR SENSITIVE GROUPS — two categories lower than the actual readings. The actual rolling 24-hour average during the preceding day was over 175 µg/m3, well into VERY UNHEALTHY levels. The Borough’s real-time site dangerously misinforms residents that air pollution is less of a problem than it really is. 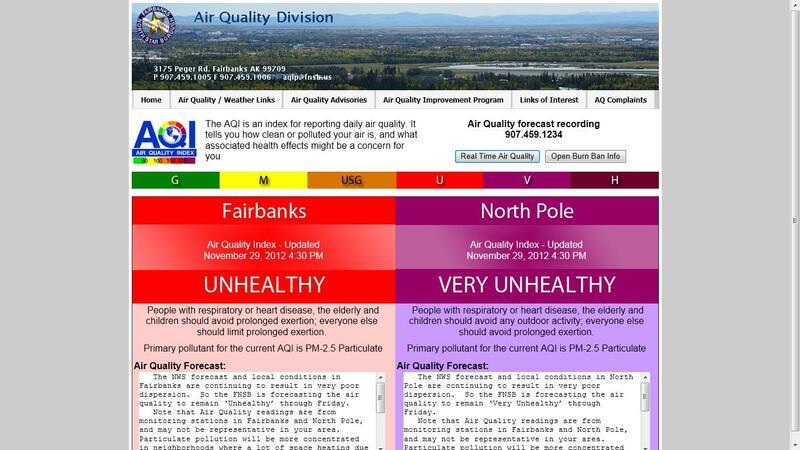 The displays of all four Fairbanks and North Pole locations consistently underreport pollution levels. When this problem was raised with Dr Jim Conner, Borough air quality manager, Clean Air Fairbanks listened to his belabored explanation that the data point represents the peak number in a hypothetical “Gaussian curve.” The color coding is dictated by the EPA risk level for that hypothetical curve. Yet, by assuming the current hour’s reading is higher than the imaginary set of 23 hours (to fill out the day), the estimated risk representation is likely much lower than is supported by the actual data. [Confused? Talk it out with Dr Conner 459-1325, jconner@fnsb.us>.] No other air quality department releases real-time information this way, for good reason. Why does the Borough continue to publish fictitious information that underreports the risk to residents? It is creepy and wrong. 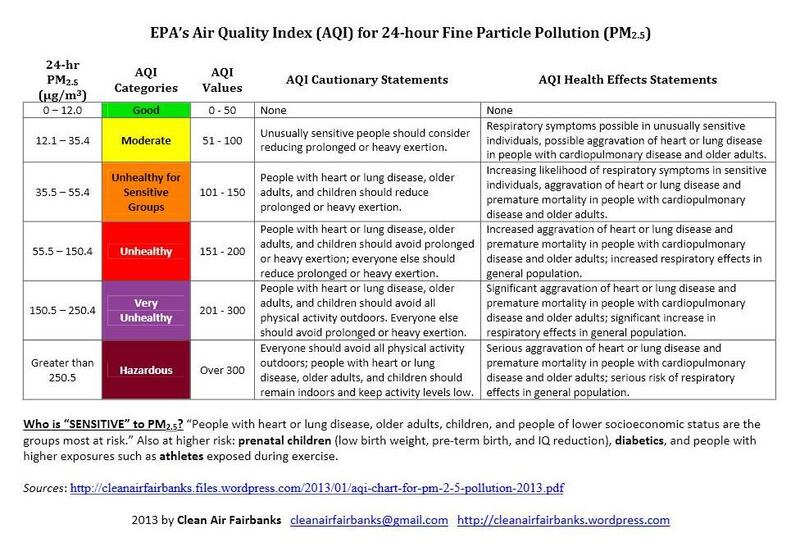 According to EPA, “everyone” is harmed by VERY UNHEALTHY levels of air pollution. It is important that the Borough give the public real-time air pollution information. However, in providing real-time data, the FNSB has failed to use the precautionary principle. Any error in assessing risk should be on the side of caution. It is an abuse of public trust to systemically underestimate risk and misinform residents, thereby placing those seeking current, relevant guidance at greater risk. 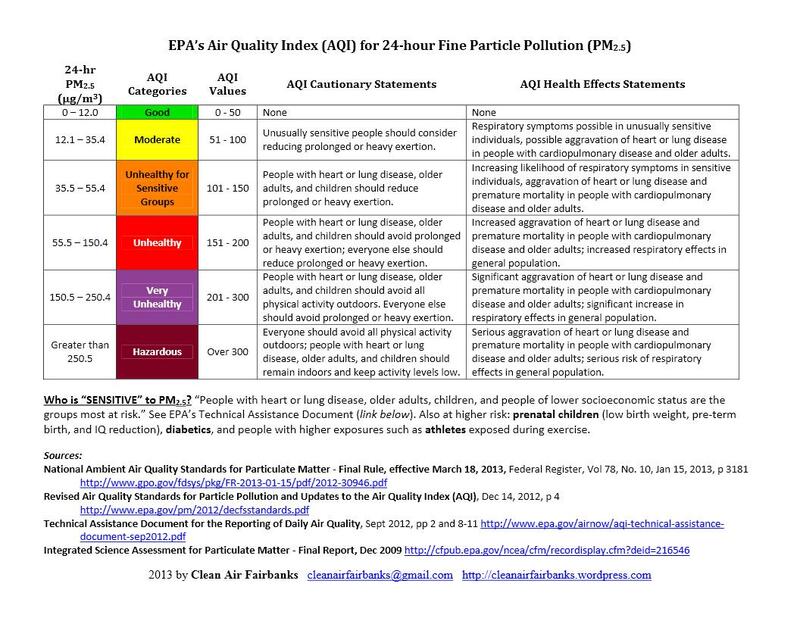 Instead, the Borough should report the risk level according to EPA’s Air Quality Index table and include a note at the bottom of the map that the colors represent risk levels from EPA (at 24-hour exposure at this level). This is how it’s done on https://twitter.com/BeijingAir. It is simple and clear, without any made-up numbers. The latest FNSB tweet (March 29, 2011) from http://twitter.com/AQfairbanks needs to take a tweak from BeijingAir. Do you know the PM 2.5 levels at your child’s school today? Today, several schools were in pockets of air pollution. Feb 10, 2012: Ladd Elementary/Tanana Middle 47 µg/m3 and Watershed 38 µg/m3 early this morning. Air quality was reported to the public as MODERATE by the Borough at 9:30 am. These schools were actually UNHEALTHY FOR SENSITIVE GROUPS which starts at 35.5 µg/m3. With temperatures over 20ºF, kids will enjoy outside recess today. Are your children’s playgrounds in the smoke? Sometimes the sniffer driver heads out to North Pole. Feb 6, 2012: North Pole Elementary 53, North Pole Middle 78, North Pole High 47, Badger Road Elementary 75, Ticasuk Brown Elementary 50, and Fire Station (3288 Hurst Rd) 120. The breakpoint into UNHEALTHY begins at 55.5 µg/m3. The sniffer driver should know the hazard and mask up. 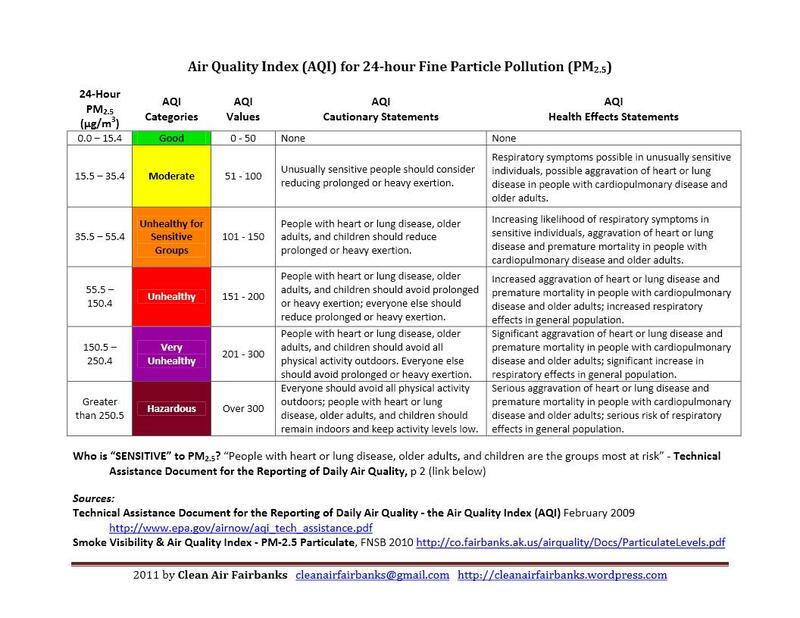 But do parents and children know about the current PM 2.5 levels, health risks, and how to reduce exposure? A new report on dangers to children walking or riding to school highlights “substantial wood smoke” as a health and visiblity problem at Woodriver Elementary but fails to offer any recommendation to address it. The report does not mention the coal smoke problem along Birch Lane near University Park Elementary. Comments on the draft will be accepted until October 24, 2011. Comments will help develop an effective plan for improving bicyclist and pedestrian safety around Fairbanks Metropolitan Area Transportation System (FMATS) area schools. The record of harm to public health and history of inaction by the Department of Environmental Conservation at Woodriver Elementary School and neighborhood is chilling, and, to DEC’s acute shame, ongoing. The nurse at Woodriver Elementary School reported four children had asthma attacks that day and that “the woodsmoke was bothering students.” Clean Air Fairbanks reported on the asthma attacks endured by Woodriver Elementary students: Don’t Wait for another Asthma Attack at Woodriver. A map from data sampled by the FNSB sniffer vehicle of PM 2.5 concentrations near Woodriver Elementary School and Watershed Charter School. Nearly 2 years later, DEC issued, not another unenforceable letter, but an enforceable order. Still, no action has been taken to stop the smoke emissions. March 24, 2011 Reported by an employee of Woodriver Elementary School . . .
We have a terrible smoke blanket covering the playground coming from across the street. There is a strong smoke smell in the entry way and the office. Several people, including myself are complaining of eyes burning. Not the kind of “blanket” to wrap around a child. After three winters of harm at Woodriver, DEC still has not requested a cease and desist order from a judge. Managers at DEC were informed of the “significant” smoke during the first winter of smoke in 2008/2009. Yet, the outdoor wood boilers continue to smoke as recently as of yesterday morning, March 29. Children are sent to school where they learn and play in smoke. Prisoners of the smoke, children, teachers, and neighbors alike are held captive by the smoke emitter’s whim. The regular presence of woodsmoke through the neighborhood, on the playground, even in school hallways is accepted as “normal” and is not considered justification for enforcement. Enforcement is seen as too extreme and to be avoided at any cost. The State is beginning to review evidence documenting harm. Victims have been asked to produce documentation such as medical reports attributing burning eyes, swollen lips and tongues, and asthma attacks as “proof” of the nuisance. All the while, the cause of the harm–the smoke emissions–is allowed to continue. On DEC’s watch, a crime against humanity has occurred, with children the most innocent of victims. In DEC’s world, any amount of smoke is not a violation. Only after a body count has been amassed, long after the damage has been inflicted, does DEC consider the evidence possibly worth pursuing. As DEC’s air quality division website states, “Clean air is essential to every breathing moment.” So why has the third winter gone by and still DEC has not stopped the smoke at Woodriver?